The Alpha House Shelter opened on January 18, 1982 in Victoria Park as a safe haven for clients and an alternative to city cells for those affected. Alpha House innovatively combined both a shelter and a detox centre in the same building, sometimes referred to as a Social Shelter/Detox, or a Community-Based Intox/Detox. Clients who are intoxicated will be admitted to the Shelter and directed to the Social Detox area where they will be monitored by staff who are trained in withdrawal management. This intervention has helped many vulnerable Calgarians to recover from alcohol and drug abuse. We maintain a small but effective volunteer base of Board Members and administration help. 1982 – Alpha House opens its Shelter and Detox. This is a pivotal innovation for clients with alcohol and other addictions. 1985 – the team concept of client care is instituted with four teams made up of a Shift Supervisor, Senior Recovery Aide and a Recovery Aide. 1992 – with the help of Royal Canadian Legion No. 1 and Alberta Public Works, a women’s dorm of four beds is opened in Detox. 1993 – our first open Friday night Alcoholics Anonymous meeting is held. It remains a popular meeting to this day for men and women in the community. 2005 – our Outreach program begins through a partnership with Calgary Urban Project Society (CUPS) and the Downtown Outreach Addictions Partnership (DOAP) is born. 2005 – we began operating as a 24-hour self-referral facility. 2005 – a Development Permit Application is sent to the City of Calgary initiating our Detox addition and Shelter renovation project. 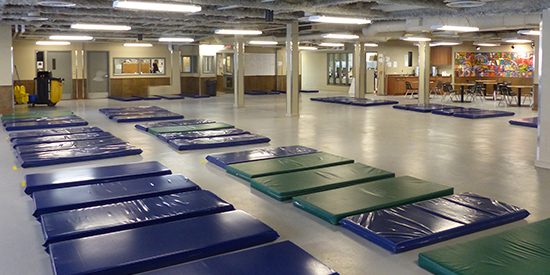 2006-2008 – with community partnerships, we operate a second shelter known as Alpha2 to meet the increased demand due to winter conditions. 2012 – we marked 30 years of community service. 2012 – opened our first Permanent Supportive Housing building. 2013 – the year of the flood. Our main location was flooded. We responded immediately setting up a temporary shelter. We returned to our main building after a 6 month renovation. Throughout our history we have maintained a small but effective volunteer base of Board members, food service, client support and administration help. We presently our programs include: Shelter; Detox; Outreach (DOAP),Encampment and Connect to Care with CUPS; Housing. We offer our clients a continuum of care. Alpha House is a non-profit, charitable agency that provides safe and caring environments for individuals whose lives are affected by alcohol and other drug dependencies. Donating to us helps provide a variety of services to the local community.